Though husbands and wives go into a marriage with the understanding that caring for each other is the most important thing, in sickness and in health, it can still come as a shock when age-related ailments develop and this commitment must be put to the test. If your elderly spouse needs assistance with daily living, these tips can help make life easier for both of you. As a caregiver, your role as a spouse changes dramatically. Allow yourself time to adjust to the new changes in your marriage, and try to set aside time each day to spend as a couple. During this time, avoid discussing things related to your spouse’s home care in Harrisburg. Instead, talk about the things that interest you as a couple. The time you spend talking about other subjects can help you separate caregiving duties from your life as a spouse. If your spouse can communicate, talking about the challenges you each face can be vital to maintaining a loving, nurturing relationship. For instance, your spouse may not be able to help with chores because of his or her disability, but he or she may be able to play board games or engage in another activity that helps foster your connection as a couple. Sometimes, listening is enough to promote a healthy relationship. A life-changing illness or injury can be difficult for either you or your spouse to accept. Diseases such as Parkinson’s and Alzheimer’s or events like strokes can cause depression and other significant changes. If either of you are having trouble accepting your spouse’s changes in health, seek counseling to help process each other’s thoughts and feelings. Caring for a spouse can be challenging for even the most loving couples, and stress and burnout are two common problems family caregivers face. To help balance caring for your spouse with daily life, consider in-home care. An in-home caregiver can provide several hours of Harrisburg respite care each day, allowing you to have time to run errands or just relax. In-home caregivers are particularly helpful if your loved one has dementia or another condition that requires constant care. 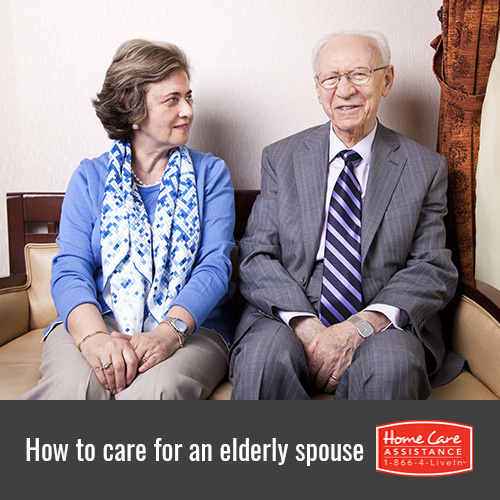 No matter how much you love your spouse, you may not be able to properly meet his or her care needs. Turn to the professional caregivers at Home Care Assistance to ensure your loved one remains healthy. Our caregivers can help with bathing, grooming, exercise, and many other daily tasks, and we also offer specialized Parkinson’s, stroke, and Alzheimer’s care Harrisburg families trust. For more information and to schedule a free in-home consultation, call one of our friendly Care Managers at (717) 540-4663.